At Barrish and Lehnes Orthodontics, we believe in providing quality orthodontic results that last a lifetime. With Lifetime Smiles, you don’t have to worry about your teeth shifting or your smile changing. We know that despite our best efforts, sometimes retainers get broken or lost, and retreatment may be necessary. 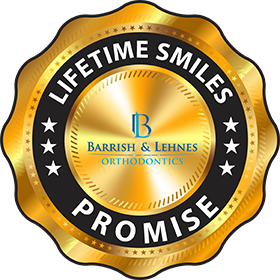 With Barrish and Lehnes’ Lifetime Smiles warranty, you can always come back to us and avoid the full retreatment fee that you might find at other offices. * Monthly fees and retainer fees subject to change based on supply costs and inflation. Please call us for the most current rates. This offer only applies for traditional metal braces. If you are interested in Invisalign treatment or ceramic braces, please contact us for our current retreatment fees.